The company Museum Music put together one of two compilations dedicated to our favorite oddball Salvador Dali. The one I am reviewing for this entry bears the title Musica Surreal. Now, I can probably guess that if you poll people on what kind of music they would associate with the famed Surrealist, I am pretty sure that modern orchestral pieces would rarely come up. 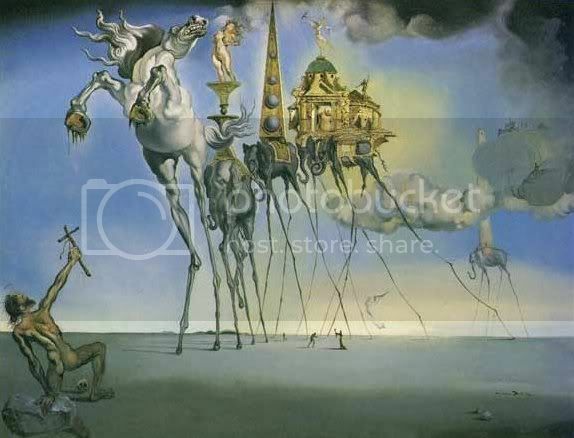 On that note, let us see if the music choices matches the work of Dali. The first track comes from the movie Spellbound, the movie where Dali put together his dream sequence. An obvious choice. Composed by Miklós Rózsa, it has this sweet and sweeping grandeur. However, the song does take a menacing yet quirky tone halfway. Then it switches to a playful mood, until it comes back to the grand intro. Oh, how it ends so gloriously. With its medley-like arrangement, this song resembles an overture in a musical. Berceuse from Igor Stravinsky’s Firebird Suite has this quiet contemplative feel with the occasional rising of a crescendo. As I listen to this song, I imagine Dali’s scenes of barren landscapes occasionally decorated with some strange objects. What do you think? Béla Bartók’s Dance Suite: Moderato walks the fine line between playful and menacing. If one can dance to this, they would end executing a very strange version of a waltz. Then again, the song’s mood changes drastically to a slow tempo until it ends abruptly. If Surrealism defines itself as two different things put together, then this song fits comfortably in this compilation. One of two Erik Satie tracks, Three Gymnopédies exudes a sedate feel with its lone piano playing. A pretty piece and great to listen to while reading, but it does not make me think of Dali. Maybe because it feels too normal and not as grand as the earlier tracks. From Gustave Holst’s The Planets come the song of Saturn. I do not know why, but I feel this incredible sadness when I listen this song. Does it capture the spirit of Dali? Not until about five minutes in. 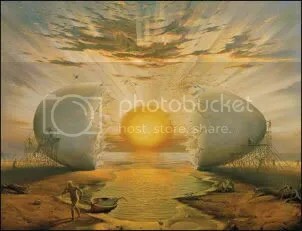 When the orchestra swells into this interpretation of an alarm going off and then immediately goes back into a slow pace, there I think it resembles Dali. The album gives us its only Spanish composer Joaquin Turina with his song La Oración Del Torero. Probably my favorite track because it constantly changes its pace, thus giving it a manic feel. I also adore the playful vibe that emanates from the violin and piano playing. Furthermore, the song’s inclusion just feels so right. La Muse Ménagère, Op. 245: La Mienne; Le Réveil; Les Soins Du Ménage by Darius Milhaud. I think the title goes on longer than the song’s running time on the album. One the other hand, it does have a nice jaunty quality to it. The shortest track in collection, Paul Hindemith’s Sonate, Op. 25, No. 3: Mäßig Schnell, Gemächlich makes for an alright tune. It does not stand out to me, which leaves me disappointed. I usually like songs with a cello. The second song from Erik Satie goes by the name Parade. The longest track in this album, it also stands as the wildest. I write that because Satie literally captures chaos with his creation. He puts so much going on the same way Dali did when he painted. The last track comes from Augustine Bassano and his song Pavan. The website lists it as an official track, but I am unable to listen and review it. Despite one song, I do think this album captures Dali and his work well. It captures the menace and fun that one finds in his work.